Península Valdés is the natural habitat of the endangered southern right whale. 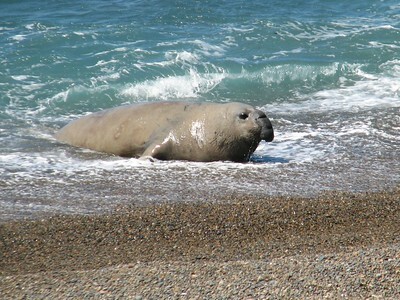 The peninsula also holds important groups of elephant seals, sea lions and orcas (a.k.a. “killer whales”). With an isthmus of only 11 kms wide, the Valdes Peninsula is almost an island. It has a dynamic coastal zone with active sand dunes. There are also numerous cliffs, bays and lagoons. The interior of the land is Patagonian desert steppe. The climate is dry with strong winds. 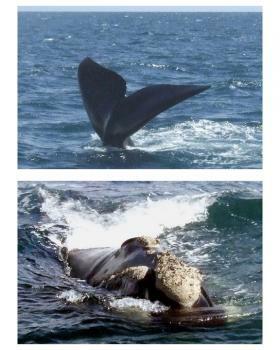 Southern right whales come to these bays to breed and give birth between June and December. They number circa 3000. The whales can be up to 17 meters long and weigh 100 tons. The orcas in these waters have developed a unique and successful hunting strategy: they chase small sea lions or elephant seals into the shallow surf until the beach, where they grab them. On first impression Peninsula Valdes is much alike the Patagonian mainland: a flat land full of scrubs able to withstand the strong winds, dotted with huge private sheep farms. A number of the common animals have run over the isthmus too: for example the Patagonian hares (maras), which are like giant cavias, and the speedy rheas with their chicks. Our first real stop was at the beach where the Elephant seals live. They seemed a sleepy bunch, lazing around in the sun. Almost all of the 100 or so we saw were females or calves. One big bull was defending the beach. However there was one moment of suspense: a younger bull casually swam along the coast line looking for a female to mate with. When he had found two lying close to the water, he decided to take his chance an quickly lugged himself up to the beach. The big bull wouldn’t have anyone touch his women though, and gave out a loud roar (without even bothering to move an inch). This message was fully understood by the younger one and he quickly retraced his ‘steps’ and went back to the sea. The morning hadn’t started out well for the seals – a few hours before an orca had come up to the beach and grabbed one of the elephant seals. National Geographic was there at the right moment (the photographer was just leaving when we arrived), and of course had it all on camera! Whale Watching obviously is the highlight of anyone’s visit here. It was my first time, and I really enjoyed it. From the little town of Puerto Pirámides no less than six companies offer trips. Due to too strong winds, we had to wait until 16.30 to take off. The boatsmen don’t have to navigate very far into the bay to encounter these giants. Right at the start we saw one southern right whale jumping up and down. These whales are easy to see and to follow, not as difficult as dolphins for example. It’s hard to take good pictures though as the whales come to the surface for short periods only. Also, as the boats are fully loaded (a bit too much for real comfort), it’s quite hard to get a good position and keep standing upright with your camera in hand while the boat is rocking. Most of the time we stayed with a mother with a white (albino) calf. They’re just so huge, often it is like watching a submarine. In October 2017, I spent a few days at Península Valdés, probably the best place on the South American mainland to see marine wildlife, where I saw nesting Magellanic penguins (the penguins were generally indifferent to visitors and waddled to within a few feet of me, often too close for photography), southern right whales (which visit the warm waters surrounding the peninsula between May and December to mate and give birth), guanacos, rheas and Patagonian mara. But the best wildlife viewing was around 50 miles from Puerto Madryn at Punta Ninfas, where my guide and I climbed down 300 ft cliffs to a rocky beach that’s home to several breeding harems of southern elephant seals. Due to the tricky descent, the beach doesn’t receive many visitors, and I was the only visitor during my three-hour stay. In addition to the elephant seals, I was lucky to see several killer whales patrolling the coastline, but they didn’t attempt to capture any of the baby seals resting along the shoreline — the area is famous for orcas that employ this unique hunting style. I visited the peninsula and Punta Ninfas with Marcos from Catalejo Travel -- he was one of the best naturalists that I have encountered. I think the authorities have done an excellent job of protecting the peninsula and making it accessible for tourists. There are a lot of information booths and good viewing points so you can see the animals and the landscapes. But visitors are also kept a respectful distance so as to not disturb the wildlife. I organised a tour through my accommodation in Puerto Madryn and was happy doing it that way. Peninsula Valdes is a world heritage site primarily about the fauna you can find on the peninsula. You get to see whales, penguins and sea lions. With a little luck you may also stumble across an Orca swimming near the shore line. The landscape is very similar to Patagonia overall with the noted exception of the sand cliffs and beaches. To explore the peninsula I booked a tour. The island is way too large to do any exploring by foot or by bike and the sites too far apart. You end up spending loads of time driving across the island to get to the different view points. Our guide estimated that a round trip from Puerto Madryn is about 450km, a good part of it on gravel roads. To really get to see all the animals you will probably need multiple days and tries. On my day trip I saw penguins, sea lions and whales, but no Orcas. Also, the whales didn’t come that close to our boat. If you plan going, make sure to check the season and the presence of the animals. The hub for Peninsula Valdes is Puerto Madryn. There is a local airport, but most flights go via Trelew. There is a shuttle service from Puerto Madryn to Trelew (Transfer PMY) which you can preorder online or in your hotel and it provides a connection to all flights, even the early ones. However, they forgot my reservation and I only caught my flight because another couple had ordered via the hostel. So, in the evening have your hotel call the shuttle service to confirm. Puerto Madryn also offers many bus connections. You can travel along the coast to Rio Gallegos if you want to get to El Calafate and Los Glaciares “fast”. Or you can turn inland to Esquel (recommended for Los Alerces and Cueva de los Manos) and travel along scenic Ruta 40. To connect to Buenos Aires by bus is possible, but seems rather painful. Peninsula Valdes is huge. Please check the distances yourself. There is no way you can explore this by foot or by bike. So either you rent a car or go with a tour. If you rent a car, get full insurance (LDW). This applies to all of Argentina. Tours are offered all around town; it’s easiest to ask in your hotel. Prices were around 70 USD for the tour and another 70 USD for whale watching. You are not guaranteed to go whale watching, so this part is optional on their and your part. Please consider staying on land if you know to be susceptible to sea sickness. 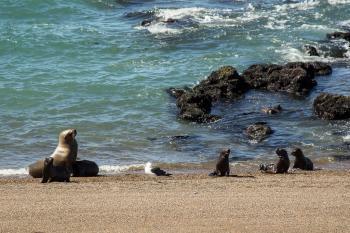 There is a sea lion colony just south of Puerto Madryn that can be reached by bike. 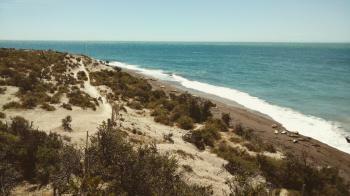 Puerto Madryn also has a beach. If you rent a car you can also visit one of the largest penguin colony of the world at Punta Toma. Finally, Trelew is another Welch immigrant town. Peninsular Valdes offers some of the best opportunities of any continental location worldwide to view 3 iconic marine mammals – Whales (The “Southern Right” in this case), Elephant Seals and Orcas (or “Killer Whales” – though strictly these are “Ocean Dolphins” rather than “Whales”). Add to these further creatures such as penguins, sea-lions and a sample of Patagonian terrestrial animals such as Guanaco, Armadillo, Rhea and Mara (“Hare”) and anyone interested in wildlife will find plenty to see! The UNESCO site covers both the terrestrial Peninsular and the waters of the Gulfs to its north and south. ELEPHANT SEALS. September/October might have been more optimal since most of the males, having arrived around August, had already left and their spectacular “fights” were not on view. It must also be said that, for those who are going on to S Georgia or the Antarctic, the views of Elephant Seals on Valdes are somewhat “tame” compared with what you will see later since the numbers are considerably lower and the viewing (understandably) is kept to a distance of around 200 metres or more behind fences or up on cliffs. So quality close-up photography isn’t possible –there is no walking right among the creatures on the beach as on S Georgia! WHALES. Their “best season” is Sept-Nov but they are viewable May-Dec. You can get whale views outside the Park from the promenade at PM or nearby beaches but these do not really match the close ups of swimming, blowing and breaching which you should get from a boat trip in the Park. Whale watching was the main purpose of our visit and we did 3 trips, having good views on each (photos), but it was only on the last that we encountered whales who “took an interest” in the boat (which is not allowed to chase them) and hung around! As always with wildlife “time on the trail” is what counts! ORCA. November was not the best time for these and we didn’t see any here. They may be seen along the ocean facing coast between September and April but are best in Feb/Mar. Your chances of just seeing them “en passant” in your vehicle are not great (whatever the tour salesmen in PM say!) and really you need to throw time and money at the problem by staying nearby with your personal transport to increase your chances – choose a time of high tide if you want to see them catching seals (and still hope for very good luck!). a. The Peninsular is surprisingly large “up close” and a round trip from the major local town of Puerto Madryn (PM) will eat up over 400kms. A group might find a rent-a-car the most pleasant way of covering the ground – a lot of the roads are dirt however so watch the insurance excess! b. There are daily peninsular minibus tours from PM at around Arg $115 (US$1 = Arg $3.1). These will give you a reasonable “feel” for the place but the land scenery is, in all honesty, rather bleak/dull and you will see similar, as well as the terrestrial creatures, during any other land travelling you might do elsewhere in Patagonia. 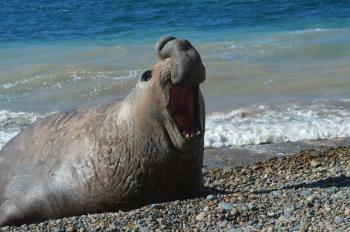 Such a tour will give you a relatively short stop at 1 or 2 elephant seal haul-outs and a penguin colony. It will also include a stop of up to 2 hours at Puerto Pyramides where the whale-watching boats are concentrated. A boat trip will be an extra Arg $75 for a 1hour +/- trip. c. If you want to stay in the Peninsular overnight and/or arrange your own boat trips there is a daily bus (“Mar y Valle”) at 9.30am from PM to Puerto Pyramides (hotels and hostels) returning at 6pm. Tickets are Arg $12 each way. d. There is an Arg $40 entrance fee per day to the park. If you are on the public bus the tickets are issued with incredible slowness and bureaucracy by a single guard dealing with up to 40 people, noting details such as nationality in a little book, as well as handling cash/tickets etc – thus delaying arrival at Pyramides and reducing your boat possibilities! Tickets can be purchased at tourist offices in town or the bus station if you want to do your bit to speed this up! e. The public bus doesn’t stop at the newly built visitor centre at the neck of the Peninsular. This isn’t a terrible loss but you will miss some great toilets, a baleen whale skeleton , some explanatory displays on topography/geology/fauna/history etc and a somewhat disappointing viewing tower. g. There is much debate over which of the numerous boats and companies is “best” for whale watching in terms of the type of boat and of the length of trip made. If you are on a minibus trip you will have no choice anyway and, even if you make your own arrangements, there may not be much more since the various companies exchange customers in order to maximise loads and minimize trips! h. The lengths of our 3 trips varied considerably from under an hour to almost 2 hours. This seemed to depend both on how cooperative/interested the whales were and on whether the operator wanted a quick return to fit in another trip! Discounts down to Arg $65 and $55 are available on 2nd/3rd trips booked with the same company. Timing of departures is totally in accordance with Argentine culture in such matters – they WILL be late! i. We noted 3 main types of boat being used. A large catamaran, a smaller sports-fishing type “speed boat” and a rubber-hulled “zodiac” type craft. You may be lucky (or you may have time to make the choice) and get a trip which is less than full, but normally the boats are pretty packed (I would even say over- packed for good viewing). The catamaran is very wide and I gather that views are pretty minimal when whales are on “the other side” and moving across isn’t easy. I found the rubber-hulled craft too low as whales are best viewed from above in most circumstances (unless you are very lucky and get a whale which is very “interested” in swimming around the boat). I personally preferred the “speed boat” which had high viewpoints on the bow and on a platform above the wheelhouse (but hanging onto the railings in the swell whilst taking photos wasn’t easy – life jackets are compulsory!). So - best of luck with your “decisions” on these matters!! I visited the Penisula Valdez in November of 1983. In my visit, I saw Sea Lions lounging on the beach at Punta Norte; a literal mass of birds on Isla de los Pajaros; an enormous Elephant Seal on the eastern shore; and viewed right whales from the bluff overlooking Puerto Piramide. It was a long time ago and I understand that the area has seen many improvements. This was a memorable trip and I look forward to a return visit in the future. Penguins: Magellenic: Five reproductive colonies have been identified at Península Valdés: Isla de los Pajaros, San Lorenzo farm, outer Caleta Valdés, Islands of the Caleta Valdés, inner Caleta Valdés. Salt Flats: "An interesting basin (42 meters below sea level) contains two salt flats, "Salinas Chica", 12 km2 in area, and "Salinas Grande", 35 km2". Lowest (below sea level): -40 m.
Early Pleistocene: Esta roca esta formado por diversos perfiles de la era Terciaria, y entre 25 a 2 millones de anos se sucedieron diferentes ingresiones y regresiones del mar, sumado a cambios de temperatura y corrientes que generaron diversos estratos que hoy vemos representados por ejemplo en el alto acantilado de la Punta del mareógrafo en Puerto Piramides. 58 Community Members have visited.